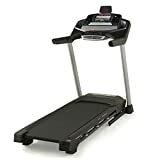 Boasting a powerful 3.5 HP continuous duty Mach Z Commercial Plus Motor, the ProForm Premier 1300 treadmill has a maximum speed of 22kph (13.7mph) and 12 levels of incline to increase muscle recruitment and workout intensity. For easy selections, there are direct speed and incline controls and a built-in 10″ full-colour touchscreen Web-Enabled display lets you check the most important workout stats and surf the net at the same time. The Premier 1300 offers an oversized 51cm (20”) x 152cm (59.8”) running area and an impressive selection of 34 workout apps, as well as iFit Live compatibility for challenging interactive training. For convenient storage, the machine features SpaceSaver® folding design with EasyLift- Assist and to get you entertained while exercising it has a music port for iPod® or mp3 player, two 2-inch speakers and a tablet holder.